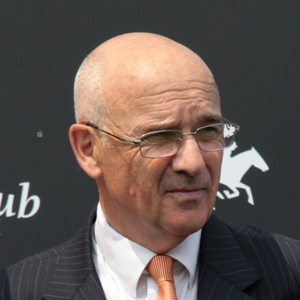 Born at Le Mans on Alain de Royer-Dupre has been one of France’s leading trainers for more than three decades. He was brought up at the Haras de Saint Lo, a national stud farm managed by his father. He spent eight years working for Jean Couturie at the Haras du Mesnil and began training there with three jumpers. His first win came with El Morucho in a chase at Nantes on April 23, 1972, and he went on to take a public licence at Montfort Le Retrou, where he oversaw some of the Aga Khan’s second-tier horses. Following Francois Mathet’s death in 1981, he moved to Chantilly to become the Aga Khan’s main trainer. He saddled Lashkari to victory in the Turf at the first Breeders’ Cup meeting in 1984 and has enjoyed success at highest level around the world. His star performers have included Vadamar’s sire, Dalakhani, winner of the 2003 Prix de l’Arc de Triomphe, 1999 champion Sendawar, and the brilliant filly Zarkava, whose unbeaten career finished with a victory in the 2008 Prix de l’Arc de Triomphe. He was also French champion trainer in 2008. The outstanding mare Pride, winner of the 2006 Champion Stakes at Newmarket and Hong Kong Cup at Sha Tin, was another stable star. Although he has won all the French Classics more than once, he has yet to win a Classic in Britain. He landed Australia’s most famous race, the Melbourne Cup, with Americain in 2010. His stable stars in 2012 included the fillies Giofra, who landed the Group 1 Etihad Airways Falmouth Stakes at Newmarket on July 13, and Shareta, successful in the Darley Yorkshire Oaks on August 23, both in the Fillies & Mares division of the QIPCO British Champions Series. He annexed two Group 1 races in 2013, the Irish Oaks courtesy of Chicquita and the Prix de l’Opera on Arc Day with Dalkala. In 2014 he went close with Narniyn in the Markel Insurance Nassau Stakes, losing the lead well inside the final furlong to finish second and a similar tale unfolded in the 2015 Investec Coronation Cup as star filly Dolniya had the race grabbed from her clutches by Pether’s Moon in the final 100 yards.